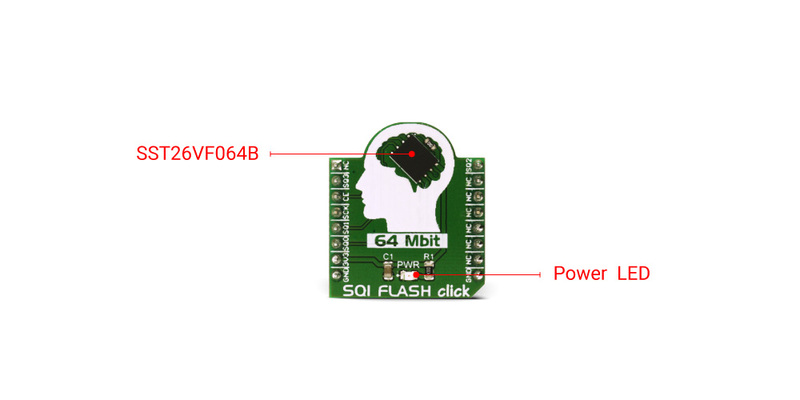 SQI FLASH click is based on the SST26VF064B, a 64 Mbit Serial Quad I/O flash device from Microchip. The chip utilizes 4-bit multiplexed I/O serial interface to boost the performance. The click is a very fast solid-state, non-volatile data storage medium, that can be electrically erased and reprogrammed. Operating at 104 MHz, the SST26VF064B enables minimum latency execute-in-place (XIP) capability, without the need for the code shadowing. Features like the high performance and reliability, make the SQI Flash click the ideal choice for network appliances, DSL and cable modems, wireless network devices, automotive and any other applications, where high-speed reliable data storage is needed. Further benefits are achieved with its proprietary, high-performance CMOS SuperFlash® technology, which significantly improves the performance and reliability and lowers the power consumption. Flash memory architecture includes a memory array, stacked with a large number of flash cells. A basic flash memory cell consists of a storage transistor with a control gate and a floating gate, which is insulated from the rest of the transistor by a thin dielectric material or oxide layer. The floating gate stores the electrical charge and controls the flow of the electrical current. SQI Flash click features a 4-bit I/O interface, that allows for low-power and high-performance operation. SST26VF064B also supports full command-set compatibility to traditional Serial Peripheral Interface (SPI) protocol. System designs using the SQI flash devices, occupy less board space and ultimately lower the system costs. The SST26VF064B device is configured as a regular SPI device after the power-on, keeping the backward compatibility with the SPI interface. Once started by using the regular SPI interface, the device can be configured to work in the Serial Quad Interface mode by setting the config registers. SQI requires four data lines to be connected to the MCU for a proper operation. Compared to the conventional SPI module, the main difference is that during one clock cycle, the SQI is capable of delivering four bits at the same time, where the SPI can deliver only one bit per cycle. This makes transfer four times faster than with the conventional SPI interface, for the same clock speed. Since not many MCUs support hardware SQI mode, SQI mode is often implemented by the firmware, which toggles a group of four GPIO pins. This method is also known as the bit-banging method. MikroElektronika software libraries offer an easy way to access all of the important functions of this device. SQ2 - Setting this pin to a LOW logic state and the WPEN bit to 1, enables hardware write-protection. To disable hardware write protection, either the SQ2 pin should be set to a HIGH logic level, or the WPEN bit to should be set to 0. SQ3 - Setting this pin to a LOW logic state will temporarily hold the serial communication, while the device is selected by the CE pin. When using this feature during the memory transfer, access times can be significantly reduced, since the device does not have to wait cycles to be addressed by the CE pin, which is the case when it is fully stopped. Once selected by the CE, the transfer can be started or stopped instantaneously at any moment. This pin must be pulled up HIGH while not in use. There are several more features on this device used to protect and manage data, such as the factory programmed serial ID number, which can not be changed. This can be used for an identification or building various kinds of security devices. On a top of the factory serial number, it is possible to define a second, custom serial ID number, which can be locked by a protection bit. The device also has several non-volatile memory locations for storing protection/lock bits - so the device won't change the protection status when restarted. The SST26VF064B is manufactured with proprietary, high-performance CMOS SuperFlash® technology. The split-gate cell design and thick oxide tunneling injector attain better reliability and manufacturability, compared with alternative approaches. Thanks to that, the SST26VF064B device significantly improves performance and reliability, while lowering the power consumption. The SQI Flash click is powered by a single power supply from the 3.3V rail. The total energy consumed is a function of the applied voltage, current, and time of application. Since for any given voltage range, the SuperFlash technology uses less current to program and has a shorter erase time, the total energy consumed during any Erase or Program operation is less than alternative flash memory technologies. Applications The SQI Flash click the ideal choice for network appliances, DSL and cable modems, wireless network devices, automotive and any other applications, where high-speed reliable data storage is needed.